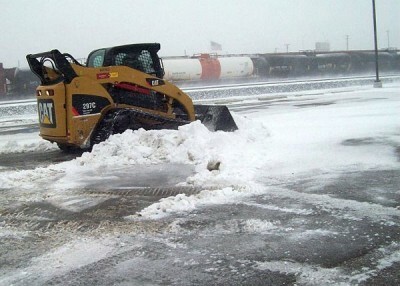 The largest snow removal company in the Nanaimo area, Clark Pacific Excavating has the experience, knowledge and resources to handle all your snow removal and maintain a safe winter environment. We have a vast fleet of snow clearing equipment to take on your project, whatever it is – meaning we can tailor our services to suit the size and shape of your property. Not to mention, our team is on the clock 24/7 during high season! Clark Pacific offers complete winter services for residential, corporate offices, retail stores, industrial properties, government sites – naval, army, and military, shopping centers, hospitals, health care facilities, city lots, streets and more. As well, we monitor 20+ weather stations in our area 24/7, and are privy to special reports from the city, airports, and government sites – meaning we’ve always got your best interests covered with it comes to Mother Nature! Included in our arsenal are only the BEST de-icing products (ask us today!) for your safety. Our workers pride themselves on the efficient, speedy clearing up of parking lots, sidewalks, and driveways, which are then salted for ice control. We can push the snow out of your way or remove it from your property – it’s YOUR choice. We work for your safety and convenience! It’s never too early to consider your winter safety needs – contact us today for your free assessment and estimate. Got some questions? Need advice? Copyrights © ClarkPacificExcavating 2013. All rights reserved.